This is the view from the back door this morning. *sigh* By the way, that is facing due east, so the sun definitely has its work cut out for it today. It's not quite as dark in the distance now, and we escaped the hail again, thank goodness. I'm going to work some more on the website today. I managed to get the Classes page updated. There will be some more news there very soon. I'm also learning how to add a Pay Pal shopping cart to the site, which is my next cyber goal. And last, but definitely not least, I've got a sample that wants desperately to be stitched. It's called Atlantis which, by the way, was not what I was going to originally name it. It took on a personality of its own while I was designing it. I love it when the beads talk to me. Which leads to a question for you. You have heard me say (or read) that the beads "talk" to me, so I'm curious. Does your artistic medium speak to you on a regular basis, or are your conversations more sporadic? As always, inquiring minds really want to know! I'm just about ready to start working with the web site. In the meantime, think beady thoughts. Later, beadlings! Yes, I know I said more photos but other things had to be done today. First, we had to treat the chickens for mites. This was just too much fun. And since it's spring, we needed to disinfect the hen house and yard so we just did it all at once. Then it was off to Newflower Farmers' Market in South Austin for some healthy yumminess. We came home with fresh spinach for spinach salad, some ribs for grilling, and some potatoes for baking and stuffing, plus a whole bunch of other yummy stuff. Basically, my more mundane existence interfered with the artistic existence. These things happen. It is wonderfully warm here and the garden has started sprouting. We have blooms on the tomato vines and little bell peppers are in the making. 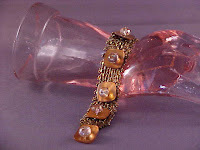 I have three more new bracelet patterns which must find their way onto the web site for a total of eight new patterns. Now you know what tomorrow's plans entail. I will be sure to let you know how that goes. Beady stuff will return tomorrow. Life is good. I hope the same for you. We had an early morning storm yesterday and I snapped this one after taking Bella out for her morning walk. I couldn't resist. 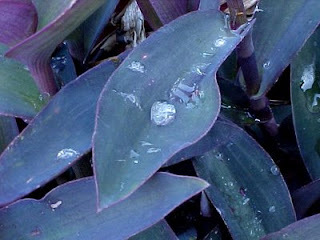 The little orb of rainwater looks kind of like a tiny biosphere. That could just be me running on lack of good sleep, though. I also couldn't resist a stately white flag. I have several, but this is the tallest. The rest of them always kind of slump, but not this one. She always stands tall. 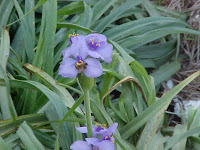 I love spiderwort. I get short blooms like this and I get the ones that are three feet tall. The honey bees love these, too. When it is warm, you can walk out the front door and be serenaded by their humming. What do you mean this is not what you were waiting for? I told you I'd give you pictures. Oh, alright. This is Midas. This bracelet will be going into my Etsy shop shortly. And there are more pictures, I'm just waiting for the camera battery to charge. Did I mention that I'm in the market for a new camera? Yep, it's true. Old Faithful, my beloved Mavica, is on the downhill slide and I must upgrade. Anyway, as soon as the battery is ready I'll go back to the photo studio and get some more goodies up here for you and the Etsy store. Stay tuned, beadlings. I'm on a roll! Need I say more? Today's agenda includes those photos and some righteous beading! Have a great weekend, beadlings! I hope it's warm and dry wherever you are. This is so new for me. I haven't had this occur since I worked for that particular, unnamed state agency. I have more than two irons in my little fire. I've got so much going on that I must now schedule my days out almost to the hour. Some things I can tell you about, others must wait a bit longer but I promise to let you know as soon as possible. I'm still trying to finish the photos. The weather here has been so much less than cooperative. Clouds, dreariness, tornado watches, thunderstorm warnings. *sigh* It's definitely spring here. 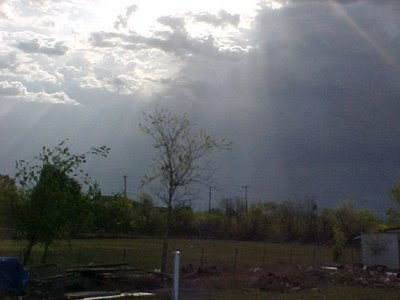 Right this minute there are storms moving straight up IH35 from San Antonio and I have thunder boomers all around me. This weather is really starting to piss me off because, as of right now, I have three wonderful things to share with you -- two bracelets and a goddess who really should become a fabulous pendant. I have five new bracelet patterns in the works for you peyote stitch lovers. This calls for web site work. 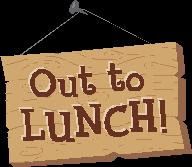 Again, the weather throws a big monkey wrench in the works since the lap top battery only stays charged for so long at a time, and we all know that I slowly muddle through the Microsoft web site programs! Never mind the fact that the patterns must be extracted from the Mac which must be plugged in. Crapola. There are days it would pay to be in control of the weather. Today was supposed to be for running errands. Again, crapola. So, where my life was not so long ago just beads and beading and beaders, I find that I must now pull out all those managerial skills I thought I gave up. Let me tell you, that extraction is actually painful at times! I buried all that crap waaaaaay down deep. And as soon as I can plug in again and use the camera, I'll update. Here's the short list: In April, I have a project being taught to the Dallas chapters of the EGA. In May, I may (hee hee) be back in San Antonio. In June, I'll be in Milwaukee with Carol. Skip ahead a year and I will be in Dallas for the EGA Regional Seminar. This is just the tip of the ice berg as there are several behind-the-scenes items to be taken care of. 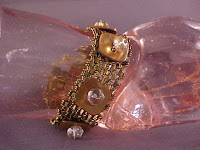 Things like more class proposals, more designs, a look book and , last but not least, keeping in touch with my beadlings. And since I've written you a novella today and I'm down to 33%, I must run. Stay warm and dry, wherever you are. I'm done. The quickie is over. All that's left to do is take photos and put them somewhere in my little cyber world. I will alert the media when that has taken place. Meanwhile, I'm going back to the crystals and pearls for a while. It's a gorgeous, GORGEOUS day here. I hope it's the same wherever you are. Enjoy the rest of your weekend. Down the hole is where my week went. I decided to bead a very quick piece early on. The base itself went just like THAT. Snap, and it was done! Okay, there was some minor distraction that caused what should have been beaded in one day to be beaded in two. Still, for me this was a "quickie". So there it was, all sparkly and coppery and slinky and, for all intents and purposes, finished. Then WHAM! The beads took over. Now it is out of my control. Some warm coppery brown shells jumped up on it and decided to move in. Then the shells called the rose and amber puffy rondells over and now it's just a big party that I seem to be catering (as in I'm not an invited guest, just the hired help). On the up side, this particular party is just about over and then I can go back to my crystals and pearls until I decided to bead another "quickie". As a result of all the beads partying, I have shirked my responsibilities to the web site. I'll try to get a couple of things added on Monday. Ariel goes back to school and T-man goes back to his regular work routine and I'll be home alone so that gives me opportunity to get a lot done (in a perfect world). We'll see how that goes. You know what is said about intentions . . . . I have a question for you. This question applies to both creative types and corporate slaves. When you are working/creating/executing, what is your biggest distraction? When I worked in the real world, my biggest distraction was meetings. Nowadays technology is my biggest distraction. What's yours? You've Got To Love Freebies! Great blog, great jewelry, great give-away! Go take a peek at Lorelei's blog! I'm beading. Pictures later. See ya! Happy St. Patrick's Day. Did you know that there are truly no snakes native to Ireland? Aye, tis true. There never were any to banish. Perhaps Patrick's were allegorical snakes. It's another bright, sunny day here in Central Texas. I love it! So why am I so miserable? They lifted the burn ban and everyone has decided to burn piles of brush that have been waiting for six months or more. What's in the piles of brush? Ragweed, ragweed is in the brush. There is a bit of cedar in the brush, too. Oh, and there is a LOT of Johnson grass. Argh. So I'm going to try to work today between wiping the tears from my eyes. I wish I could say they were tears of joy but, alas, they are just tears from my stinking allergies! ARGH! I'm off in search of beads for a quickie. Pionta Guinness, le do thoil!! Slán agus beannacht leat! I've been a slug long enough, basking in the afterglow of projects completed. It's time to get back to work. I picked up a tray that had been set aside and spent yesterday beading and unbeading and writing and rewriting. This is a project I had started a few months ago but set aside because the beads were not behaving. Fortunately for me they changed their minds yesterday and finally lined up to my satisfaction. What? Oh, well there is some Bronze and Vitrail (yummy green flashes there) and some Crystal Brown Pearls, topped off with some wonderful Mocca AB (if you have not seen this color, go check it out) and Bali silver. Just picture it. Later I'll picture it for you. I've also got some nifty, quick stitch bracelets calling my name so I may have to split my time between the two. Maybe that way I can throw a few more things into the Etsy store. And, oh my stars, just imagine if I managed to get a pattern or two tossed up onto the web site. Why, then I might actually be an overachiever! GASP!! It practically makes my head spin, which is no easy feat considering that I'm dizzy most of the time anyway. And on top of all this, it is a warm, sunny day (following some very cold, gray days). Sunny days are always good for inspiration. Your question for the day: What type of day inspires you to get creative? Leave a comment. Otherwise, how will the rest of us know what you think? Holy crap, beadlings. Yesterday was brutal. I slept the day away simply because moving caused excruciating pain. Today is much better, but I'll be on the computer all day. That means not much creativity coming forth. And it is still pouring and it's still cold. *sigh* Such is life. And as I don't have much else to say, that's it for the day. Have a great weekend! And it is not at all enjoyable. The plants seem to be happy, but they are pretty much alone in that sentiment. Yep, it's spring in Central Texas, y'all. Quack. We haven't seen rain in so long we may not recognize it when it gets here. You could smell the moisture in the air last night. It's humid right now, but still sunny. To top it all off, tomorrow afternoon is supposed to be a doozy with thunderstorms and more cold wind. I'll keep you updated. As for everything else, I'm still trying to adjust to the time change. It may take a couple of weeks. Yesterday was fairly productive, so I'm going to see if I can make today even more so. But you know what they say about the best laid plans . . .
That is what has happened here. SPROING! Everything is turning green and blooming, except for what little grass we have. My mom told me that my grandad always said when the mesquite trees start budding it's time to plant, so we did. She said it never failed him, so I'm crossing my fingers. The new garden (garden number 1) is full of mounds with seeds and tiny plants. 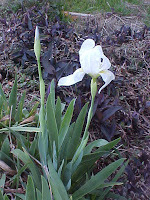 My irises are in full bloom and the rose bushes are starting to fill out. The birds are even making nests. I hate springing forward, by the way. I would love to not need to change my clocks twice a year. Did you know that the incidence of heart attacks spikes every spring when the clocks move forward? Yes, it's a fact. And the same incidences decrease in the fall when the clocks are moved back. And circadian rhythms are thrown all out of whack. Ugh. This is just not good for us. I envy my friends in Arizona who don't go through the changes! Lots to do today. I've got more orders to take care of, more samples to stitch and some new patterns to tweak, and more work needs to be done on the web site. I really need two or three of me. I'm still waiting on that replicator! One garden is planted. Yippee! One down, three to go. We may have to start calling him Farmer Man (or Till-Man, as Chica says). He's determined to make me a country wife. Hmmm. We'll see. I'm content to go out there for about an hour and that's it. That's more than enough sun time for me, but I do love the smell of freshly turned dirt. I got into another treasury. Everyone loves the Coral Reef Bracelet. 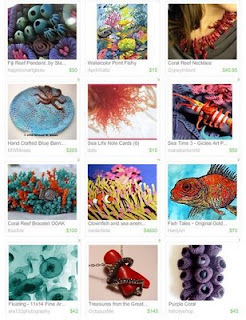 Many thanks to Vickie at Happy Hound for putting it in her treasury. My plans for today are to get some stitching done and maybe make some earrings. There are so many beads in the room that it's a bit overwhelming right now, kind of like a small tornado, and things are all muddied together so that I can't tell one from the other. Maybe the house will fall into Oz later and things will become colorfully clear! I got no sleep last night. T-man got no sleep last night. He had to go to the office, but Bella and I are just sitting here on the sofa unable to get motivated. I didn't get up until 10:00, so half the day is wasted already. I need to (ugh) clean house today. That is NOT my favorite thing to do. Maybe I'll be distracted by some shiny things later. That's always a good excuse. Have a great weekend! Bead something marvelous. Web site updates (not much, but it's a start). 1: a person who paints or draws as a profession or hobby. 2: a person who practises or performs any of the creative arts. 3: informal a habitual practitioner of a specified activity: a con artist. 1: a person who works in, or is skilled in the techniques of, any of the fine arts, esp. in painting, drawing, sculpture, etc. 2: a person who does anything very well, with imagination and a feeling for form, effect, etc. This is almost as thought provoking as the difference between art and craft, isn't it? When I tell someone that I am an artist the first question I usually get is "What do you paint?" Occasionally I get "What medium do you use?" And then "What type of artist?" Then I try to explain exactly what I do and with what. It is much simpler if I have something on my person to show them but that is not always possible. For instance, right now I have jewelry samples scattered all over the country and few to wear! But I digress. What is an artist? I love that phrases like "con artist" are included in the definitions above. So, what makes me an artist? According to jury panels of several art shows, I am an artist because I am skilled in a technique considered a fine art and I work in mixed media. According to the New World Dictionary above, I'm an artist because I do something ". . . very well, with imagination and a feeling for form, effect, etc." Hmm, what is the "etc." I wonder? Websters-Merriam says "one who professes and practices an imaginative art". I can identify with that and I hope there are a few folk out there who identify me as that. So your philosophical questions for the day are these. What makes an artist? Are you an artist? Do you fit any of the definitions above? Share. You know we like to find these things out about you. 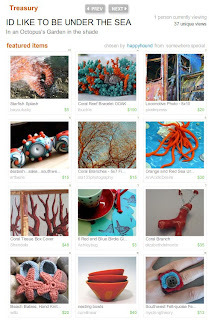 Many thanks to OVResident for including it in his Treasury. Yes, I am. Carol must have had a great weekend of sales because I am plumb tuckered out! There were so very many people at this show that at times it was literally impossible to move in the booth. I got to see some old friends and got to make some new friends. I saw some gorgeous beaded jewelry being worn, and I saw some very unusual color on "gemstone" beads. Who knew rocks could be fuchsia or lime green?? But Carol's acrylic goodies were a big hit and I do believe I cut a mile of chain this past weekend. Today, I'm going to work on the (cue the dramatic music here) WEB SITE! *gasp* "Did she say WEB SITE???" Yeppers, she did. We'll see how that goes, won't we? Tomorrow, I'll have a big philosophical question for you. What? You thought I was done with those? Hardly. After all, this is Bead-Mused so there must be regular musing. Okay, my computer is in my lap and my feet are up and that is pretty much how I intend to stay today, beginning right after lunch! Happy Monday.